To complement the bouquets of the bride and bridesmaids, the groom and his attendants wear boutonnieres. These typically contain a single focal flower that matches those in the bouquets. 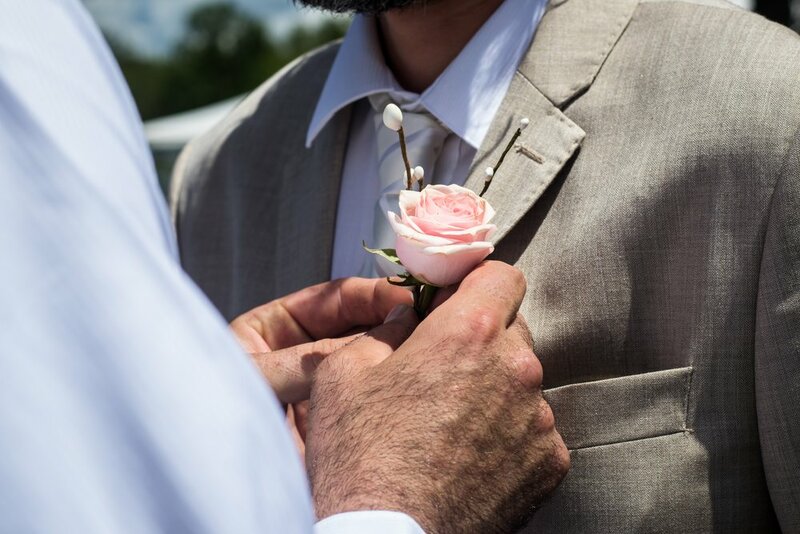 The ring bearer, officiant and ushers also usually wear boutonnieres, as do fathers, stepfathers, grandfathers and other male members of the couple's immediate family. There aren't any set-in-stone traditions about who gets to wear wedding-day flowers. But here's who most couples choose to honor: The parents and stepparents, grandparents, any other immediate family members who are not in the wedding party, ushers, and the ceremony readers. Step parents: Your wedding day is not the time to let the world know how much you dislike your new step-father by giving him a smaller boutonniere or not giving him flowers at all. Step parents should be honored in the same fashion as your blood parents. Better to keep the peace. Everybody or nobody: If you are going to give a boutonniere and corsage to your God parents make sure you do the same for the groom’s God parents. The same goes for aunts, uncles, cousins and siblings. Personal preferences: Some people really, really dislike wearing a boutonniere or corsage. Ask your family what they would like. Women can wear a pin corsage, wrist corsage, hair flowers, flowers on a purse or they can carry a posy bouquet. Men are limited to a boutonniere. But if your wedding is especially casual and the men are not wearing a jacket with a lapel you can choose to omit the boutonnieres altogether.